This variety is ideal in shallow, stoney soils. Strong growing plants give a reliable crop. Gives an interesting look to any dish with it's unusual shape. Whether you’re a beginner or experienced gardener, anyone can grow carrots. These crunchy and sweet vegetables are a staple in the kitchen garden. Depending where you live in the United Kingdom, you might be able to grow them all year round in a greenhouse. Most supermarkets limit the choice of carrots to differing preparations – grated, batons, mini, and full-sized – rather than variety. With carrots, you will be offered a cornucopia of choices in both size and colour. 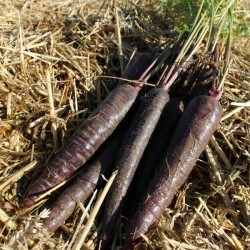 Carrots can be stout like the Oxheart, which will grow in containers or shallow soil, to the Danvers Half Long, to the traditional full-length Nantes. One of the joys in gardening is growing vegetable varieties that are not readily available at the market if at all. Carrots need not be orange! 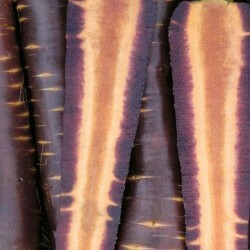 There are tri-colour carrot seeds sold in a single packet or single varieties like Purple Haze, Gold Nugget (yellow), and Samurai (Red). 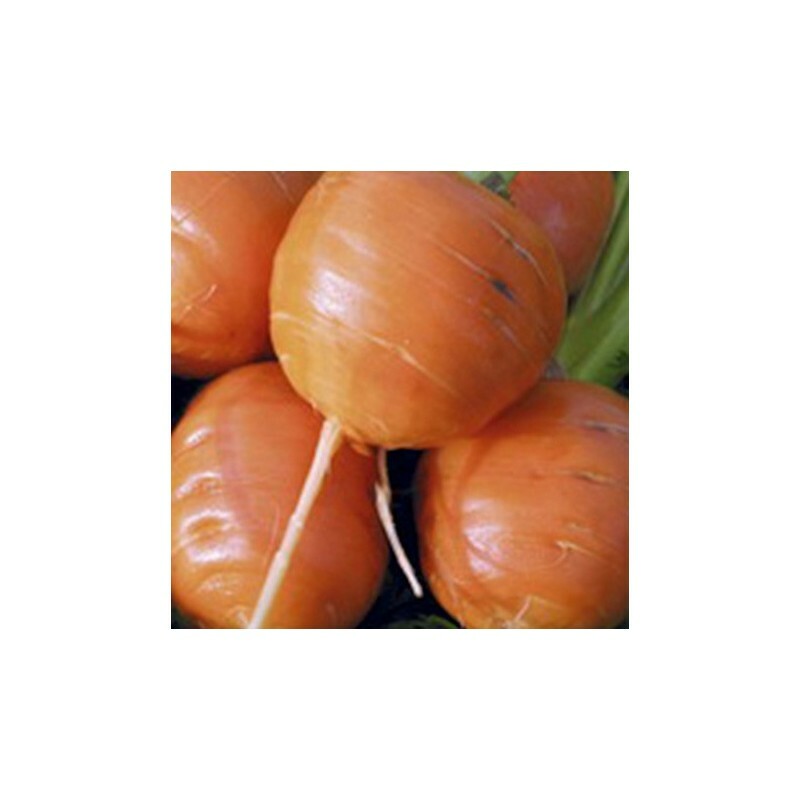 Most carrots will take between 70-90 days to mature. A gardener also must consider how the carrots will be used: Eaten immediately? For storage? Different varieties serve different purposes. Some are better for cooking, canning, and freezing than others. Please consult seed companies’ websites on which variety best serves your needs. Another decision to be made regarding seed selection is whether to purchase seed packets or seed tape, where the seeds are fastened to a biodegradable tape. More varieties are sold in packets, and you will get more seed for the price. Seed tape, however, reduces the fuss. It allows the gardener to sow seeds quickly, to have the seeds properly spaced, and to eliminate thinning as the seedlings sprout. As with everything in the garden, soil preparation is paramount for success. According to Rodale’s Basic Organic Gardening, carrots prefer loose textured soil. This is important since rocky soil will cause the roots to grow crooked and forked. Clay and shallow soils will cause the carrots to be smaller, since they will be met with soil’s resistance. Also, water has more difficulty penetrating clay. If you are uncertain what type of soil is in your garden, have it tested. This will also help determine how to organically fortify it. For carrots, if the soil contains too much nitrogen, they will grow hairy. 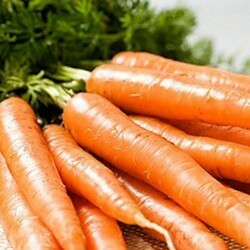 Phosphate or kelp meal will boost phosphorous and potassium levels, which is great for your carrots. The tiny carrot seeds can be sown few weeks before the last frost in a greenhouse and sown every two weeks after. One mistake new gardeners frequently will make is sowing all their seeds in day. Consequently, everything is ready at once! If you plan on growing a fair amount of carrots, plant seeds every two weeks. This will ensure a constant harvest throughout fall. Depending where you live and how adventurous you are as a gardener, you can plant carrots again in July to harvest in the winter. This may involve additional mulching or row covers, depending which growing zone you live. To plant seeds, mark a shallow line in the soil. Place about six seeds to the inch in it. Cover the seeds with 1.27 cm of fine soil. Water gently so the seeds do not wash away. When watering, consistency is paramount. 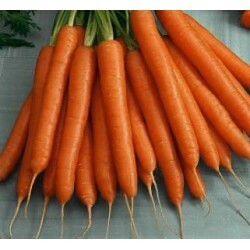 Carrots require about 2.5 cm of water per week. Watering is best in the morning and the object is for water to reach the end of the carrot. Weeds can undo a carrot bed quickly especially as the seedlings are taking hold. As the feathery tops reach several inches, thin the seedlings to one inch apart and then to 3-4 inches apart two weeks later. This will ensure the roots are not fighting for space, and this will help them grow straight. Once the seedlings take a root, a 2.5 cm layer of grass clippings or compost will help keep the beds moist and discourage weeds. Also watch for pests like slugs and earwigs. They can ravage the entire crop in a night. When harvesting, carrots’ flavour improves in the cooler weather, usually after several light frosts. However, if left in the ground too long, they tend to grow woody and are inedible. Some varieties are better for storage than others. Once harvested, remove the tops. The carrots can be stored with the soil left on them or washed and briefly air-dried. Home-grown carrots in a winter soup or stew will hold the memory of summer and the promise of warmer weather to come.